It’s been a week. How are you feeling? What has been your biggest challenge? Black coffee? No dessert? Feeling hungry? Still snacking a lot? Craving dessert after dinner? Are you sleeping well? Having headaches? Skin breakouts? Remember that timeline I shared last week? This week might be tough. MOST PEOPLE GIVE UP AROUND DAY 10. I know this is hard. Everyone who has completed W30 knows this is hard. 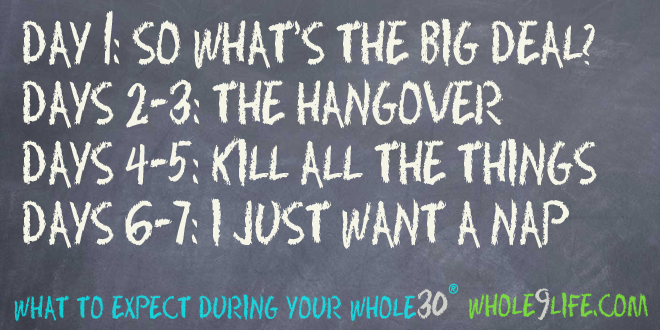 Everyone who has failed past attempts of W30 knows this is hard. What are you feeling? Think about it … Are you having an emotional response to wanting food? Hard day, so now you want pizza? Too tired, so now you want pizza? Disagreement with your bestie, so now you want ice cream? Bored? Missing your favorite foods? It’s OK to miss the foods you have given up. It’s also OK to be hungry. I know that can be hard. Part of the BIG WIN with W30 is the non-scale victories. You will start to feel better. Headaches will go away. Skin will clear. Allergies will improve. Changing your relationship with food is a WIN! Learning to cope with emotions without food is a win. Not having sugar cravings is a win. Not relying on a 3 pm snack is a win. Not celebrating with cake is a win! Food is for nourishment. Food is for enjoyment, but not at the cost of health. My favorite Melissa Urban Hartwig (the co-founder of W30) is Food Freedom Forever. I’ve also done the Bible study by Lysa Terkeurst, Made to Crave. Both of these helped me change my relationship with food. (I’m working on “my story” to post soon).